At UNIGLOBE Travel & Transat we’ve been using our expertise, knowledge and experience to organize group travel for over 30 years. So, no matter what the occasion, we’ll take you to your desired destination, provide exceptional service in the air, on land and at sea, coordinate all special moments and deliver an unforgettable vacation experience. 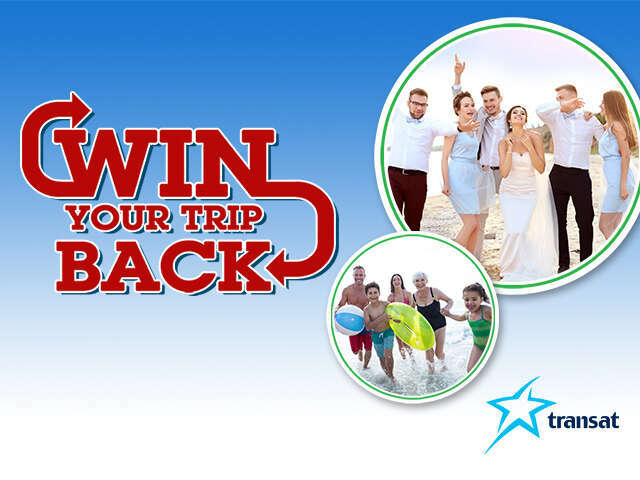 and you could Win Your Trip Back! Sun Destinations! Reduced deposit - groups of at least 10 adults pay a deposit of only $150 vs $250 for select departure dates. Destination Weddings! No deposit required for the first 30 guests up to 90 days after the booking date (or up to 60 days prior to departure, whichever comes first). Price Drop Guarantee! If the price of a South Package becomes available at a lower price than the one initially paid, Customers will benefit from our Price Drop Guarantee. 1. A group consists of 8 passengers or more. Additional benefits may be available for more than 8 passengers. 2. Book by October 31, 2019. 2. Eligibility: New group bookings for travel now to April 30, 2020. 3. One prize will be drawn, value of the prize is $2,000 CDN. 4. Prize will be drawn Nov 15, 2019. 5. Travel must have taken place before prize will be awarded. 6. No substitutions. No cash value. 7. For full terms and conditions speak to your UNIGLOBE Travel Consultant. Price Drop Guarantee (the “Guarantee”) Terms: Upon the Customer’s request, we will proceed to a one-time price adjustment, up to 60 days prior to departure. The Guarantee only applies to the same package as the one originally booked (same hotel, room category, departure date, gateway and flight) and must be available at the time such Guarantee is invoked by the Customer. The maximum reimbursement cannot exceed $400 per adult or $200 per child. The reduced deposit of only $150 is valid for travel between now and October 31, 2019. No purchase necessary to enter. To enter without purchase, send a 500 word essay about your favourite Transat destination vacation to info@uniglobewc.com before October 31, 2019 to be entered into the draw. Book your group with UNIGLOBE Travel and you may win!